Scorpions achieve growth in two major ways. Increase in body mass over time with ingestion of food brings about a small size increase as flexible membranes stretch. This method of growth has limitations due to the scorpion's hardened (non-living) exoskeleton or cuticle. Expansion only occurs between the hardened sections where flexible membranes exist to allow movement and expansion of the main mesosoma (body). The mesosoma must expand to allow for the development of embryos in females and also to allow expansion as food is ingested. This expansion comes about via the flexible pleural membranes found between the top and bottom mesosomal plates. The remaining flexible membranes between sections is to allow for the articulated movement of the various body parts. The second and most interesting method of growth comes about by shedding or ecdysis of the cuticle. To achieve major growth the scorpion must grow a new cuticle under the old, which will expand and help push the old cuticle off the body. An increase in internal body pressure helps to split the old cuticle from the area around the mouth parts and a little down the side of the anterior prosoma (head). With intermittent periods of activity and rest the scorpion manages to manoeuvre the old cuticle rearwards. This is a vulnerable period normally spent within closed quarters to keep out potential predators and also maintain the necessary climatic conditions; in Urodacus elongatus molting takes place in a sealed cell under a rock. Some species require a reasonably high humidity to complete ecdysis without problem, whereas others seem to get by in comparatively dry air. If the old cuticle doesn't release properly and becomes stuck the scorpion is doomed. After a scorpion sheds its cuticle it is recognised as the next instar, representing the next growth stage. Some scorpions such as the Urodacus genera tend to shed their old skin once a year at about the same time, in response to seasonal changes and food availability. Other scorpions such as the Buthids are likely to shed in relation to how much food has been ingested and don't have particular seasonal ecdysial periods. The number of ecdysial events varies between species, but is typically around 4-6. The growth increment at each molt is quite substantial. You will find a morphometric study of Urodacus yaschenkoi in the features index which clearly shows the various stages of ecdysis and size increments. The first ecdysis comes about whilst the young are still on mother's back. At this stage their exoskeletons are membrane-like and tend not to fluoresce under uv, showing that the cuticle hasn't hardened or tanned. This may be due to the necessary water uptake from the mother's cuticle or possibly even diffusion of oxygen for respiration. There is a decrease in size at the first instar stage as the young consume the internal yolk supply present when born. Normal feeding is not possible at this stage as mouth parts are still unspecialised. After the first instar molts it remains with its mother until the exoskeleton has completely hardened, at which time the various body parts have become specialised ready for a solitary existence. This post first-molt time with mother varies between species, but ranges from a few days to 3-4 weeks. At this stage the hardened cuticle begins to fluoresce under uv light. 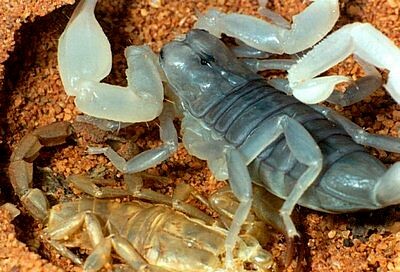 People who keep scorpions find ecdysis one of the most difficult stages for survival. Emulation of normal environmental parameters is critical for success. In the inset image we see a Urodacus elongatus that's undergone a molt in a sealed scrape beneath a rock (removed for observation). Without sealed conditions the scorpion may try to molt and fail or not molt at all. Note how the scorpion's exoskeleton lacks pigmentation at this early post-molt stage. In a week or so the cuticle will have hardened allowing the scorpion to return to normal activity.